The annual NBJ Supplement Business Report examines recent sales figures and trends, finding no reason to panic over the sales growth slowdown. Dark clouds come in different shades, and the difference between a shadow passing over the picnic and a downpour sending the whole park running to their cars is immense. Consider slowing growth in supplement sales as somewhere short of that cloudy picnic, perhaps a flock of sparrows interrupting the glare. Sales growth did drop in 2017, coming in at 5.4 percent, down from 6 percent the year before, but there was no dark cloud to be seen, no market-hobbling scandal, no health-scare study calling supplements worthless or dangerous. And if you are squinting to see that dark cloud or downpour, keep squinting. The slowdown was relatively slight and Americans still spent $43.2 billion on supplements in 2017. That’s an $8 billion increase in five years. That may not be as sunny a day as some might like, but there are no clouds closing in. The last time the industry suffered a slowdown, there was more reason for concern. In 2014, when a barrage of negative headlines seeded public doubt, growth dropped to 5.1 percent from 7.5 percent the year before. Cause and effect seemed clear, and troubling. The Annals of Internal Medicine told readers to “stop wasting money” on supplements, and a questionable study on omega-3s linked fish oils to prostate cancer, and assorted media blips and dips added blood to the water. No such cause and effect is obvious this year. We’d caution that brands shouldn’t overreact, but we’re not sure what they’d be overreacting to. The story of the 2017 slowdown might be a story of channels and natural business cycles. Brick and mortar showed drop-offs in natural and specialty, where growth fell from 5.3 percent to 3.8 percent; and mass fell even harder, with growth dropping from 5.8 percent to 3.3 percent. And even though online sales continued a sharp climb, rising from 10.8 percent to 14 percent, the $3.2 billion in that channel is too small a piece of the pie to counterweight the drops in brick and mortar. At least some of this is the mundane math of a mature market. Mass saw strong growth for a number of years, but few thought it sustainable. Some of those sales came at the expense of natural and specialty brick and mortar, leaving those channels in a weakened position, even before the siphoning of sales to e-commerce. Of course, e-commerce hurt both brick-and-mortar channels, but the numbers there might be getting more attention and alarm than they deserve. Online sales can’t entirely explain the shorter checkout lines in brick and mortar. The shortage of obvious doom or gloom is true at the ingredient level as well. Sales growth for probiotics is far lower than the Nutrition Business Journal had projected not long ago. Sales growth fell from 17.1 percent to 10.2 percent. But insider talk suggests the story is more about form and format than a disillusioned consumer. Probiotics are showing up in a vast constellation of food products where they were never seen before. People didn’t give up on probiotics. They just expect them in food and not in a pill. The story at the incremental ingredient level includes bright spots as well, though the size of these standout ingredient markets isn’t large enough to boost sales growth overall. Collagen is on fire, growing at 30 percent, but it hasn’t broken the $100 million barrier yet, coming in at $98 million. Mushrooms had another strong year at 10.1 percent growth, but it’s still among the smaller corners of the industry at $46 million. In the filtered light of expectations and assumptions, it’s easy to see those bright spots as brighter than they are and the same holds true at the other end of the alarm-and-elation spectrum with that overall sales growth slowdown. Whatever the numbers tell us about 2017, they don’t say anything about panicking. Or even reaching for an umbrella. 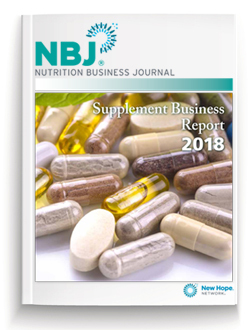 Known as the go-to guide—with more than 100 proprietary data charts—for sales data in an industry that’s notoriously difficult to track, the NBJ Supplement Business Report defines market size and growth by product category and explains the trends and macro forces you need to understand to thrive in the fast-changing supplement and nutrition industry. Get the Supplement Business Report or email info@nutritionbusiness.com to view the table of contents and receive more info.